Brands on Facebook can use Promoted Posts to extend the reach of posts to fans in an attempt to spread important content to users most willing to share it. I had released an eBook a few weeks earlier, and I wanted to take this advertising opportunity to make sure that I reached as many fans as possible. I paid $5 to reach what Facebook said would be an estimated reach of 800 fans over three days. Those are the three stats I care about most. I paid $5 to get 18 additional link clicks. That’s about $.28 per link click, which isn’t bad by Facebook advertising standards. Whether or not it’s worthwhile will come down to the value of the click to my business. Note that I did not create a controlled test to track how many people actually completed my form (which was on the page shared) after clicking the link. Ultimately, that is the most important statistic. If I received 18 email addresses for $5, I’d consider that advertising well spent. More than likely, though, I didn’t have 100% conversion. I am going to dig into this in much more detail in a future blog post, but note that I previously used Page Post Ads to target my current fans. In these cases, I promoted the link to the page where an email address can be provided in exchange for my eBook. It should be noted that the posts for the Promoted Post and Page Post Ad are not identical. Once again, the test is not scientific since the two ads are not identical. 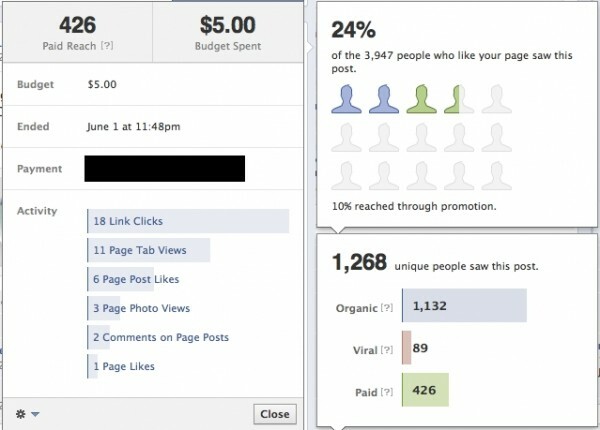 In this case, I spent $10.66 and received 20 clicks and 27 “Actions” (21 Page Post Likes, 4 Comments and 2 Shares). I’d consider the clicks most important since they lead directly to the action I want (providing an email address). So in this case, I spent a little over $.53 per click, which was nearly double what a click costs for my Promoted Post. 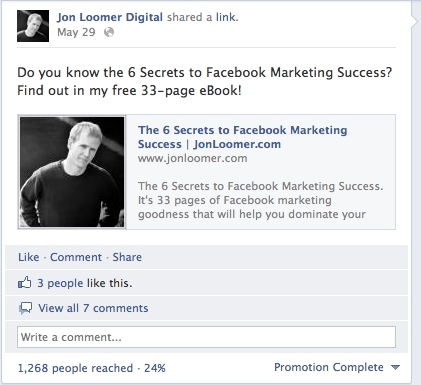 Are Facebook Promoted Posts Effective? In the future, I may attempt a more scientific comparison, but it shouldn’t be all that surprising that the Promoted Post out-performed the Page Post Ad. As we know, the Promoted Post appears as regular content in the News Feed. This is content that most (or nearly all) Facebook users are willing to engage with. 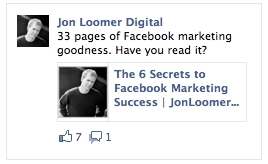 On the flip side, a hefty chunk of Facebook users repel from the advertising on the sidebar. So in conclusion, I found the Promoted Posts to be successful, driving the action that I wanted at an affordable price. Sure, I found it annoying that I only reached a little more than half the people that Facebook claimed I’d reach (and the price remained the same), but it was still $5 well spent. Have you tested out Promoted Posts yet? What are your experiences? Share them below!